The linear weighers are independent devices, which are normally mounted to the packaging machines and work together with them. The main function of the dosing device is the separating of the product into predefined doses, which are set by the machine operator. The ready doses are then fed to the packaging machines. This type of dosing devices is used for the dosing of grains and cut herbs. Generally, the weigher consists of vibrating channels, which feed the weighing hoppers with product. The hoppers are attached on weighing scales, which perform the measuring of the weight of the product. After the measured weight in the hopper reaches the set value, the vibrating channel stops, giving time for the hopper to unload the dose to the packaging machine. 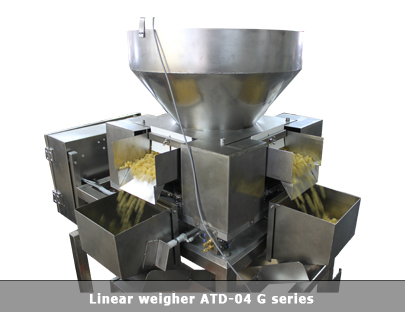 More advanced linear weighers have a mixing capability (see video) The linear weighers are very appropriate for the dosing of granulated products where the weight of a single granule/unit of about 2-3 g. If this weight is larger, we suggest the usage of a multihead weigher. Suitable products Finely-ground products with a low content of dust like sugar, salt, ground herbs, washing powder, hominy, spices, etc.